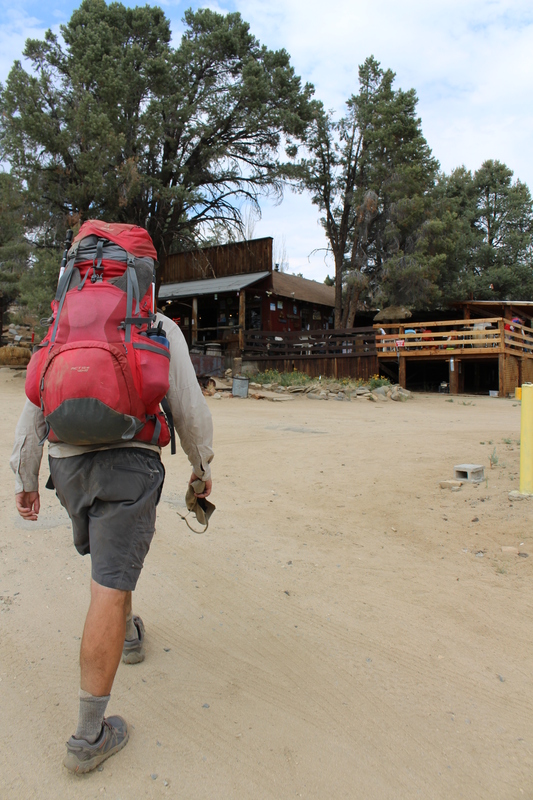 When we last left our tired little hikers, they were stranded in the ramshackle, one horse town of Lake Isabella, waiting for a shipment of fresh footwear with which to continue their journey. Sipping Dr. Pepper and watching reruns of Dirty Jobs and Treetop Cat Rescue, our hikers’ spirits shrank with each passing day like the nearby waters of the drought stricken lake. Six days! REI messed up our order TWICE and were trapped in Lake Isabella for six days. The mistake was bizarre, too. The outfitter repeatedly sent our package to our billing address on the opposite side of the country. They told us it was a weird technical glitch, that their IT department was “rebuilding” their program to make sure it didn’t happen again and that if we could wait but another day or two… Forget you, REI. Lisa and I cut our losses, determined to never order online from this company again. The lovely owners of the hotel took pity and drove us an hour to the city of Bakersfield where I bought some trail runners. That very night, Wednesday, June 24, we took off into the desert, determined to catch up with our friends (some of them almost a hundred miles ahead) and make up for lost time. We have almost succeeded on both counts, but at some cost. Lisa and I raced across 54 miles in two days. 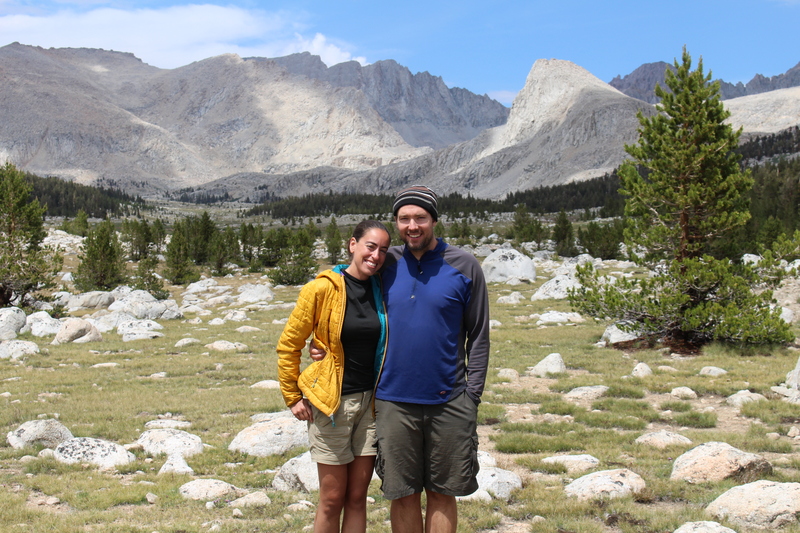 We crushed the final stretch of desert leading to hiker Shangri-La, Kennedy Meadows. I liked to imagine that every dusty step was a vengeful slap to the scorched hell’s face! We arrived, exhausted, to the bustling general store in this tiny little town nestled in the pines, population: 200. A large deck and burger shack adjoining the store was filled with roughly twenty thru-hikers, most of them we had never seen before. Per tradition, they applauded our arrival. It was a touching moment although we were almost too tired and hungry to appreciate it. Lisa and I devoured a veggie burger and real burger, respectively, then picked up the food drop and bear canister mailed by our wonderful resupply maven back in Ohio. 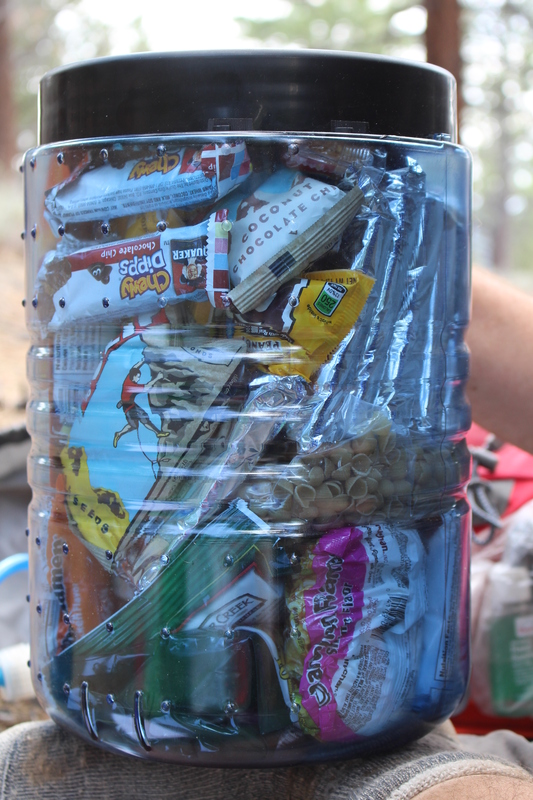 For an hour or so, we sat in a daze as we tried to puzzle how to fit six days worth of food into the bear proof container. Equally daunting was how on earth were we going to carry this thing in my pack and what to do with whatever it displaced. Meanwhile, the owners of the general store spread out a free BBQ for the thru-hikers. Not great for vegetarians, but I put away a chili dog and a couple chicken drumsticks. Our hunger satisfied but our packing situation still vexing, Lisa and I decided to call it a night and camp in the woods behind the store. As we were setting up, the zippers on our tent flap failed. We could pitch the tent just fine, but there was no way to keep out the mosquitoes and black flies, the trains of hungry ants or chilly spiders looking for a warm place to spin their webs. Our low morale took another hit. I was especially upset. We would have to order a replacement tent. Lisa was great that evening. She kept positive and figured out that we could just fold the rain cover over the broken tent flap for a partial seal. It wouldn’t be ideal for wind and rain, but for a temporary solution it was fine. While I sulked and turned in early, she hung out with the hikers at the store. The next morning, guess what company we called? We decided to give REI a third chance as, frankly, we didn’t know who else to call. 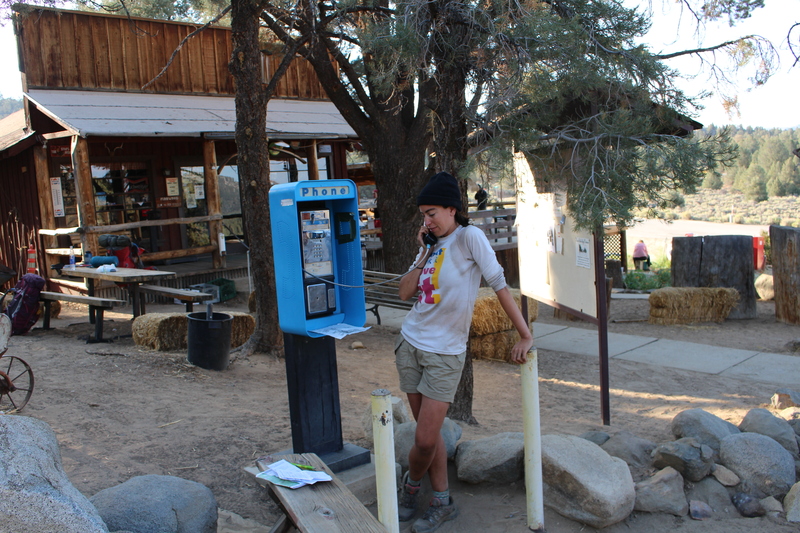 There was no Internet or cell phone service in Kennedy Meadows, but we had our caller history and a pay phone outside the general store. That’s right, they still exist. Plumbing the depths of our collective memory, back to the days of junior high after-school and collect calls to parents, we faintly recalled that 1-800 numbers were free! A call was made, zip codes clarified, and a tent was sent to Lone Pine, CA, just a few days ahead. We also solved the balancing act of the bear canister and our backpacks. Things were looking up. 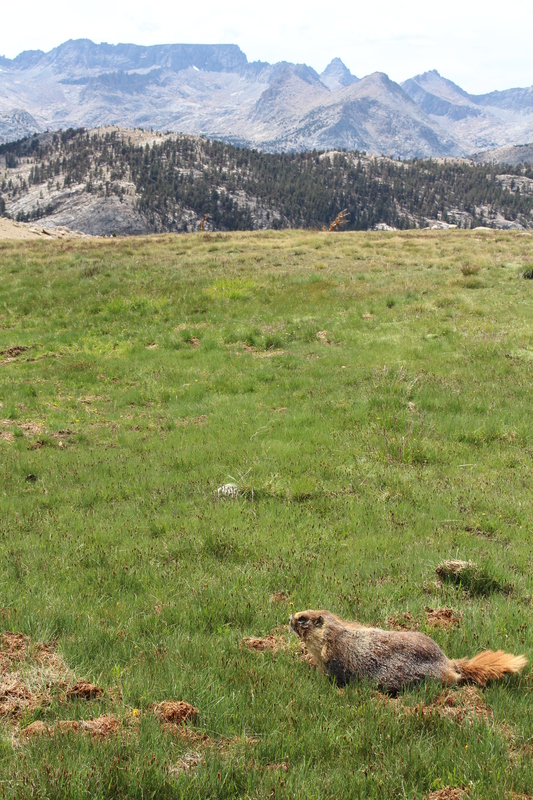 We left Kennedy Meadows and continued our climb in the Sierra Nevada. It is gorgeous up here. I’ll let some of Lisa’s pictures give the mountains some justice. Sadly, weather has been rough. Violent lightning storms have made the higher elevations unattainable. 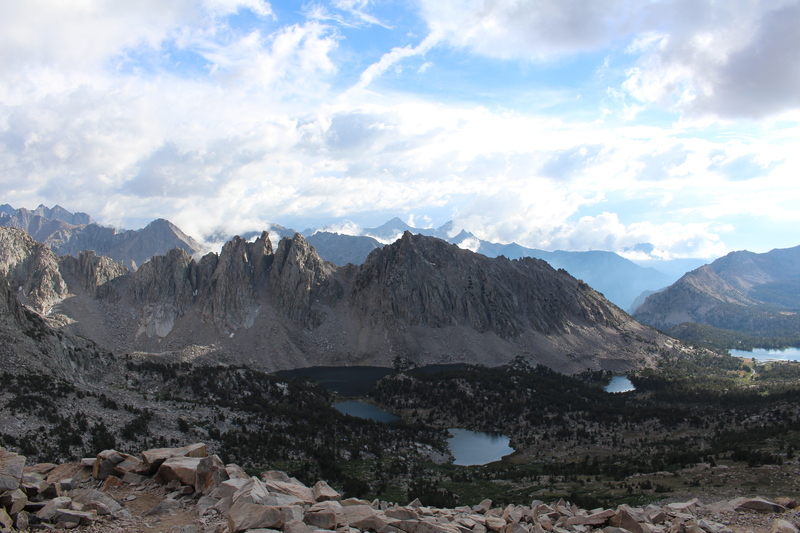 The side trip to the summit of Mount Whitney, the highest peak in the lower 48 states and a rite of passage for most thruhikers, had to be cancelled. Two nights ago, a series of storms kept us awake through the night as lightning and hail threatened our wounded little tent. 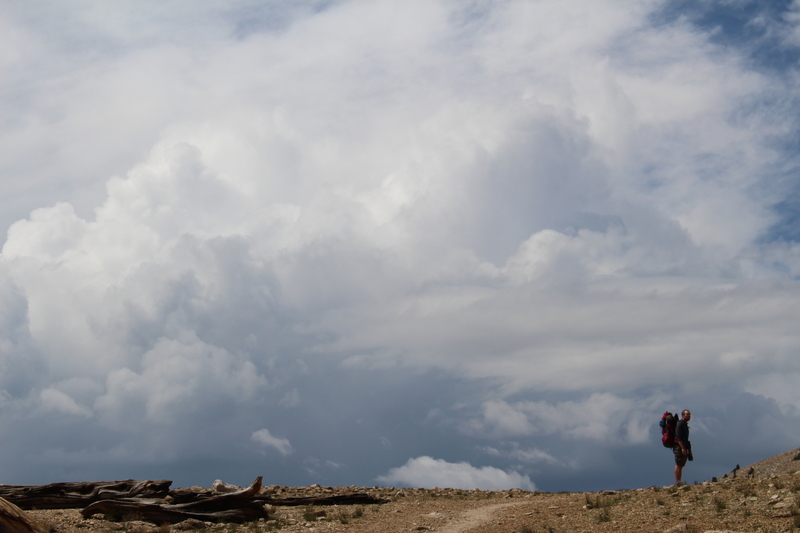 It has rained on us off and on over the last four days, up until yesterday when we crossed Forester Pass, which at 13,153 feet is the highest point on the Pacific Crest Trail. Despite the gray and drizzle, the scenery here is indescribably majestic. The swirling storms catch on the peaks like foam and only make the jagged mountains seem more haunting and insurmountable. A break in the rain. Time to take out the camera. It’s unfortunate that while we’re in such a special place, Lisa and I have been in a mental rut. We’re tired and a bit jaded. We daydream and tease out ideas of what we could be doing with our time and resources. Visiting family. Looking for work. Playing with our dog and cat. Writing novels. Surfing in Hawaii! We miss the hikers we do know, whom we thought out of reach. As a self-avowed introvert, I am especially surprised by how much I miss folks like Bushwhacked and Gummy Bear, Reid, Mike and Tess, Supertramp, and others I’ve yet to write about. We’ve been pushing so hard to catch up with some of these folks, Lisa and I have exhausted ourselves and forgotten to hike our own hike. 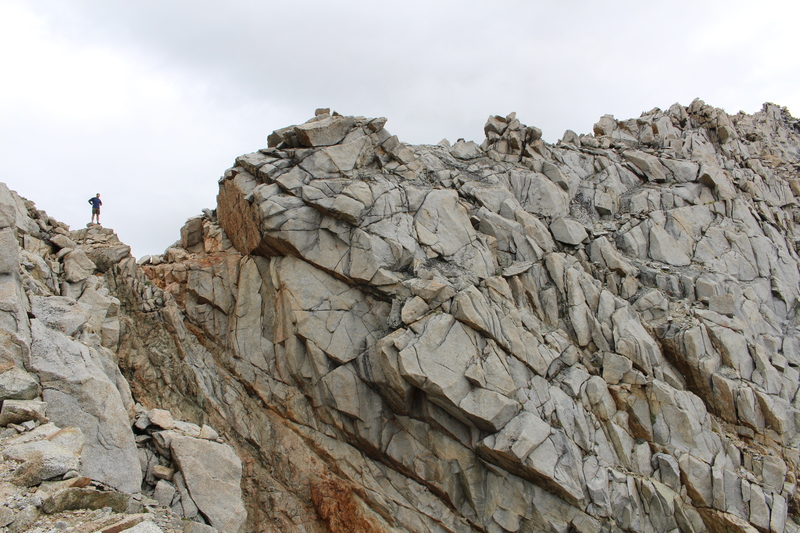 We’re passing geological marvels and perhaps not appreciating them as much as we could. We have hope our moods are about to change. The weather is improving and my feet are doing better. We picked up our new tent today. That’s because we’re in the town of Lone Pine after descending from Kearsarge Pass. On the way down from that pass, mentally and physically spent from another twenty+ mileage day, we ran into one of our favorite hikers, Reid, as he and two other hikers made their way back into the mountains. We caught him! 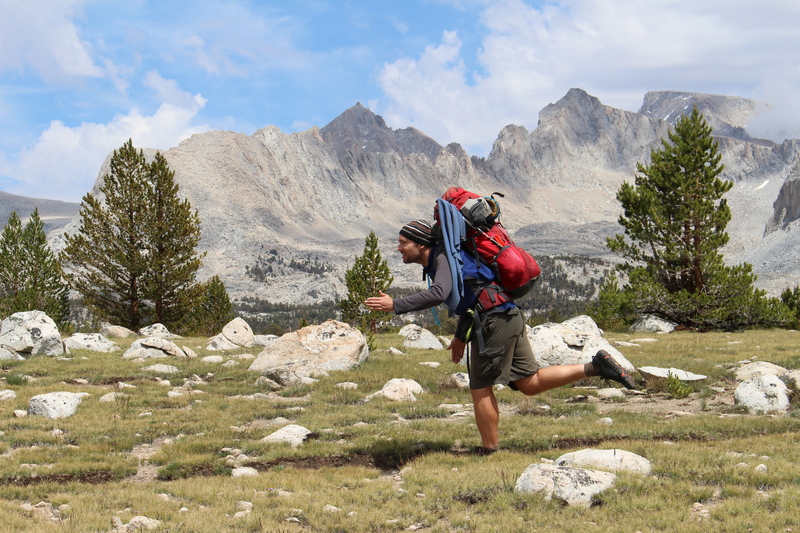 Not only that, but he had news on other hikers also just ahead on the PCT. 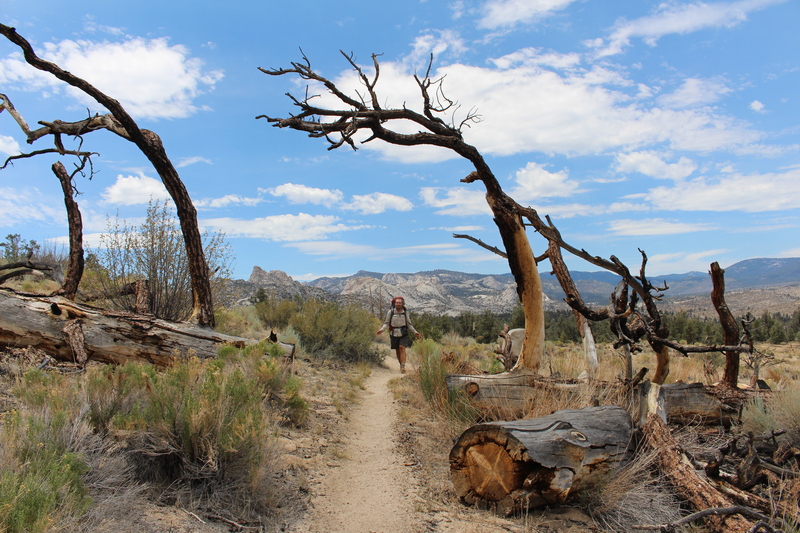 A half-dozen or so, all within a days hike, all headed to Mammoth Lakes. A day in town to rest, and we’re right behind them. Once we get back in sync, we hope to slow down. Hike shorter days and gaze a little longer at what’s about. Camp with friends and maybe hike with them a bit, here and there. Sounds like a good reason to not quit. This post and the last were a bit darker than I intended. I want to end on a positive note and say that even on the worst of days, something fuzzy or fun has stopped along our trail. Let the pictures below be proof. 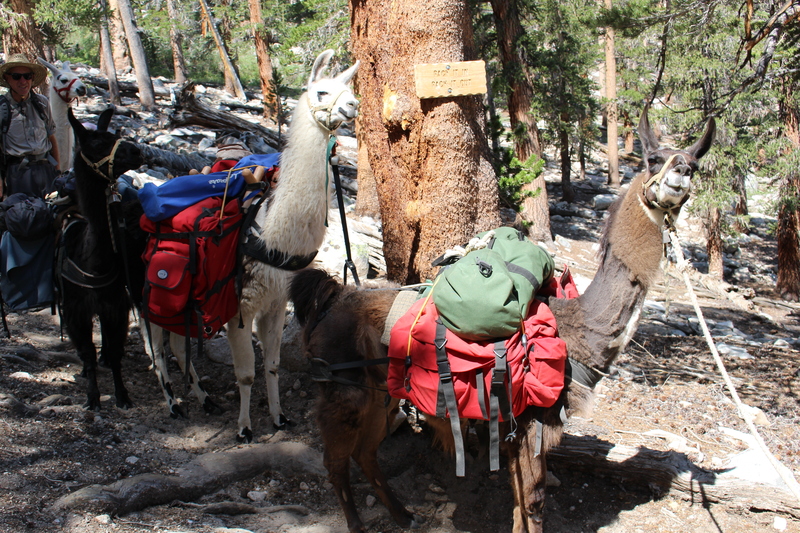 How much does it cost to rent a llama to carry your backpacks? That would be awesome. May your small joys carry you as a team through this journey and others to come.